Theia is the daughter of Uranus, Greek god of the sky, and Gaea, also known as Mother Earth. In the Greek pantheon, Theia is the goddess of all things that shine, including silver, gold, gems and even light itself! It’s no wonder, then, that she was chosen by the world-renowned Pobjoy Mint to adorn this incredible bi-metal coin, struck in 99.99% gold and silver. With a legal-tender value of 1 crown, it’s a collector’s dream – its golden center depicting the goddess sitting down while holding a shield bearing the image of a diamond-shaped burst of light. In fact, if you look closely you’ll notice that it’s not just a diamond shape, but a real diamond embedded in Theia’s shield! 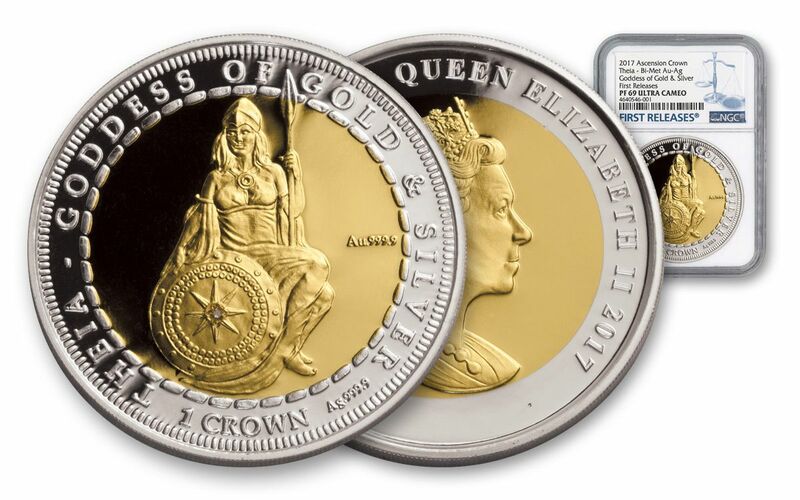 The center of the coin contains a full ounce of 99.99% pure gold, while the ring around the outside, bearing the legend “THEIA - GODDESS OF GOLD & SILVER” along with the coin’s legal-tender denomination, comes struck in a half-ounce of 99.99% fine silver. Each part of the coin features its own notation of fineness. Collectors love bi-metal coins. A coin featuring gold, silver and a diamond is a must-have for any collection – especially when it depicts the goddess of all three attributes! 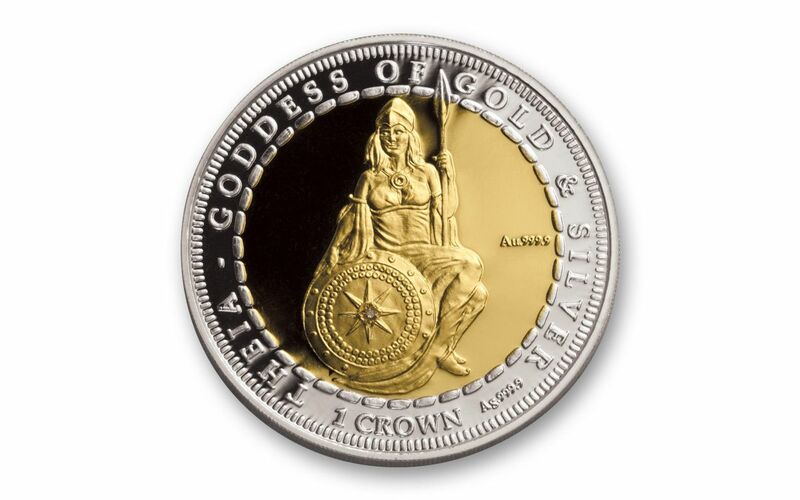 ONE-YEAR-ONLY DESIGN – This coin’s unique one-year-only design pays tribute to the Goddess Theia with not only an epic design, but with the materials used to make it – gold, silver and a real diamond! PURE PRECIOUS METAL BI-METAL COIN – The 2017 Ascension Islands 1.5-Ounce Gold/Silver Bi-Metal Theia is struck 1 ounce of pure 99.99% gold and a half ounce of 99.99% silver. GRADED IN NEAR-FLAWLESS CONDITION – Your 2017 Ascension Islands Bi-Metal Theia coin has been certified, graded and encapsulated by the Numismatic Guaranty Corporation (NGC) to be in near-flawless Proof 69 Ultra Cameo (PF69 UC) condition, a distinction that means your almost-flawless coin will showcase an impressive full strike and indistinguishable imperfections -- well above and beyond the quality of the vast majority of coins in the series! 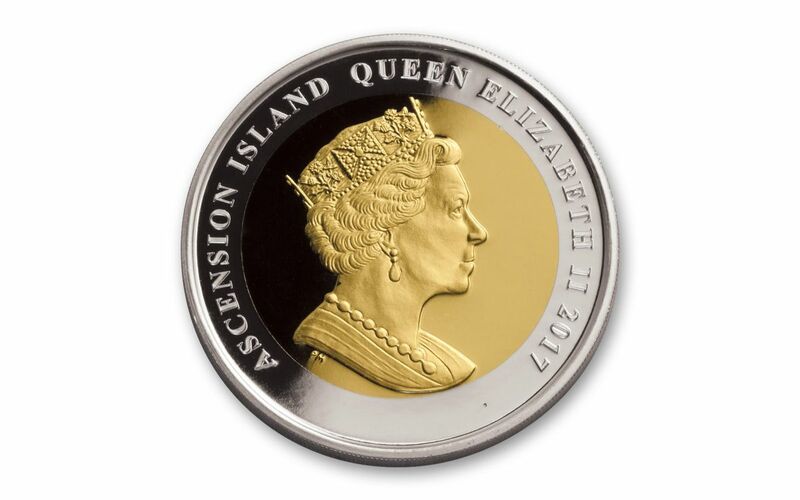 LEGAL TENDER IN THE ASCENSION ISLANDS – This coin is legal tender 1 Crown in the Ascension Islands, an isolated volcanic island in the South Atlantic that is part of the British Overseas Territory. EXTREMELY LIMITED EDITION – Just 500 of these fabulous bi-metal coins were ever struck for worldwide release – an extremely small edition limit from such a world-renowned mint as the Pobjoy Mint. Only 500 of these Goddess Theia Bi-Metal Proofs can ever be struck by the Pobjoy Mint, but we’ve managed to secure a number graded by NGC as near-perfect Proof-69 Ultra Cameo (PF69 UC) condition!